Situated in dense forests surrounded by river Koyna is the fort of Vasota, which according to the �Dnyaneshwari� means a resting place. This fort is also known by the name of Vyaghragad. We have to go back to the times of Sage Vasishtha to know how exactly old is the fort. It�s believed that a disciple of Vasishtha, a sage by the name Agasti, came to reside on a mountain on the banks of river Koyana. He named the mountain after his mentor. Later the mountain was fortified and converted into a military station. In the course of time, fort Vasishtha was pronounced as �Vasota�. This fort is believed to belong to the Shilahar dynasty era, and probably named Vasota due to the name Vasantgad given to it during that era. 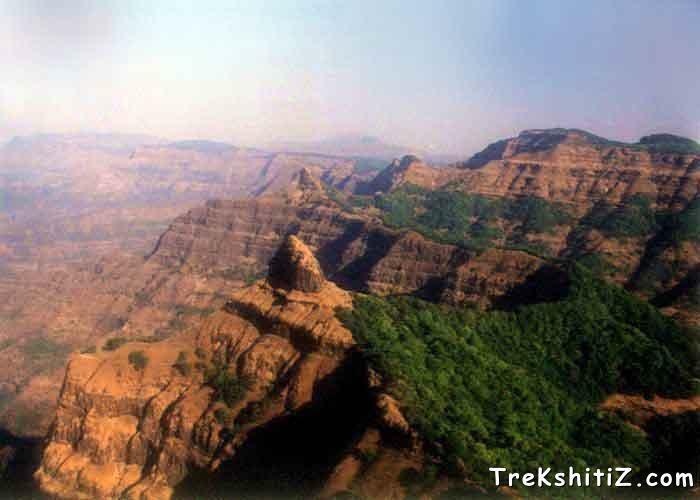 According to ancient scriptures Shivaji took Vasota after his successful raid on Javli region. But it is untrue. Shivaji took Javli and other forts in the Konkan region but Vasota eluded him. When Shivaji was trapped on Panhalgad he dispatched a battalion from his main army and won Vasota on June 6, 1660. Later in 1679, 26,000 rupees were found on the fort. Among the prisoners caught in 1661 in Rajapur, Faren and Samuel were kept imprisoned on the fort. Later in 1706, Tai Telini brought the fort under her control. The very next year Peshwa Senapati Bapu Gokhale fought with her. After 8-10 months of intense battle, Bapu Nadkarni conquered the fort. There are two entrances to the fort Vasota. The first one lies in a dilapidated state. We enter the fort through the second one. On entering the fort we see a Hanuman temple, now devoid of a roof. Three ways go ahead this temple. The path straight ahead takes us to the remnants of the fort. The one on the left takes us at �Kalkaiche Thane�. On the way is a Mahadeo temple which can accommodate 2-3 people. Moving along the path we arrive at �Machi�. The view of the surrounding region is simply spectacular. The path on the left of the Maruti temple takes us to the joint water cisterns. Water in these cisterns is potable. The way proceeds to a fascinating cliff named Babukada, shaped like the letter �U� that reminds us of Konkan Kada of Harishchandragad. The mountain seen in front of Babukada is the Old Vasota. The mountain that is seen from the Babukada on Vasota is Old Vasota. No way exists now that takes us to this fort. In addition there is an acute shortage of water. Also presence of wild animals in the area keeps the trekkers away from this fort. There are 2 main ways to reach the fort, one via Nageshwar and the one directly to Vasota. It can be said that a visit to Vasota is incomplete without visiting Nageshwar. On our way to Vasota a distinct pinnacle catches our attention. This pinnacle is named Nageshwar. A cave is carved in this pinnacle with a Mahadeo temple inside it. Thousands of devotees crowd this place on Shivratri. Water droplets fall on the Shivling from the rooftop of the cave throughout the year. Most of the trekkers generally visit Nageshwar on their way to Vasota; the only constraint being a walk for a few miles. One can reach Vasota from Satara by three different routes. Board a bus at 9 a.m. from Satara and reach Bamnoli. From here one should come to Kusapur by launch. From Kusapur 2 ways go through dense forest, the left towards Vasota and the one on the right towards Nageshwar. Catch a bus from Satara and reach village �Waghali Devachi�. Then crossing the Koyana waters by launch arrive at village Khirkandi. From here a way from DhangarWadi takes us at village �Met Indavli�. The journey from Satara to this village takes a total of 8-9 hours. You can reach the fort of Vasota from this village after a climb of 5-6 hours. From Mahabaleshwar get to Tapole village and then further arrive at Kusapur by launch. From Kusapur one can reach Vasota as described above. i)Board a bus from Chiplun at 8.30 a.m. and alight at village Choravane. It takes 5-6 hours to reach Vasota from this village. It is to be noted that there is no water on the way and one has to carry his own supply. After climbing for some time one comes across a plateau from where the path on the left goes to Nageshwar and the one on the right to Vasota. As we move ahead along the way to Nageshwar we see another path below that goes to a well through dense forest. We can cut short the total time to Vasota to just 2 hours if we take this path. ii) Arrive at Tivre village from Chiplun. From here we can reach Vasota via the Rede Ghat. 1.Mahadeo Mandir can accommodate 2-3 people. 2.A plateau near the joint water cisterns can also be used as camping ground. 3.Nageshwar cave can accommodate 20-25 people easily. One should arrange for self. The way to the right of the stairways to Nageshwar cave takes us to a well, water in which can be used for consumption. Even in summer this well does not dry out. Water is available in sufficient quantity on Vasota. Proper precaution should be taken against leach while visiting Vasota during rains.